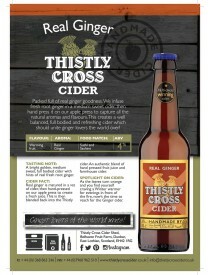 Vendita sidri Cornish Cider, shop online, prezzi - Grand Cru s.n.c. di Aprile Paolo &C.
Slightly Sparkling. Our 6.2% Farmhouse Cider is smooth, refreshing and Thistly Cross’ first born. It’s a classic, farmhouse cider made with a blend of Scottish apples. The 6 month maturation makes it refreshing, smooth & fruity. Bright golden colour with aromas of ripe apples. Soft mouthfeel and low acidity with a refreshing fruity finish. Very easy to drink, a real thirst quencher and great session material – to be drunk on a night out. Gently sparkling.